So the first big decision has been made, You purchased a personal weather station. 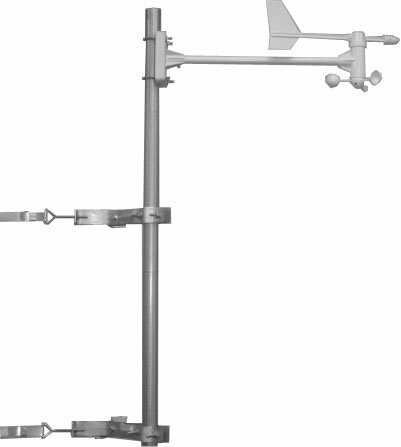 Now you need to choose from various top weather station mounting ideas. The top choices for weather station mounting are as follows. A chimney mount could be done as well. Here is a collection of the types of weather station mounting ideas from proud weather station owners. In observing these photos you will notice the many different types of locations where people locate their personal weather stations. In examining these ideas you can see that you will need to think through in your approach to successfully locating and mounting your remote sensors. If you do this well, you will have many years of climate information being collected properly and accurately. You will win if you pick the proper type of mount. As I said earlier the proper mounting will make your climate information gathering a joyful delight to you. You will be extracting the best experience from the equipment you have purchased. So in looking at the mounting ideas, if you decide on the pole mounts you will need to key in on a couple of very important points. So as you can see the stations don’t usually come with a mount set up, a pole or any mount tripod, or whatever and however you decide to fasten the equipment to it’s chosen location. You can take a look of some of the best offered on the market to use for the mounting process. If you choose to mount on your chimney We recommend this chimney mount from Ambient Weather. A note to the buyer, please be aware that the anemometer pictured does not come with the mount assembly kit. It supplies you with a 1 1/4” inch pole for mounting the sensor unit onto. It is available in 35” sections. So your mount can be 35 or approximately 70” or approximately 105 “ as a height, depending on what height you need. provides straps for mounting around the chimney. Provides a 1 1/4inch pole to mount on. 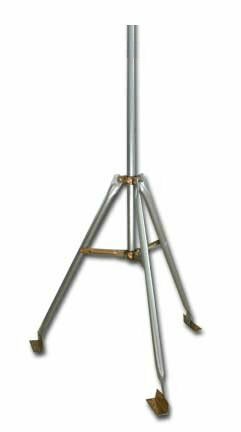 It is a Tripod mount which can ce used on a flat roof, or an area of yard or a field, etc. It is also available with a 1 inch pole for mounting. Accessories that will go along withe the Tripod Mount I have suggested to you. These will tie down or secure the tripod mount on either a ground location or a rooftop installation. These are two accessory that may need to be added to your Ambient Tripod purchase. One is a set of three stakes to fasten the tripod into the ground at the location of your set up for the weather station. The second accessory item is a set of three, pads that are designed for you to fasten down on your roof the ambient tripod mount you are buying. You will win if you pick the proper type of pole mount. You can take a look of some of the best offered on the market to use for the mounting process. You will need to secure your equipment well, so that it will stand in heavy rain, against strong wind gusts, extreme heat, and maybe even heavy snowfalls. Think through the worst weather elements that you might experience to shield against losing or having your weather equipment damaged or destroyed. So in contemplating your decision, you have decided where the station will be able to sensor the best daily climate results for your liking. Now it’s time to decide how to fasten it down and set it up. After you have purchased your weather station many different weather station mounting ideas come to mind. Mounting your personally picked weather station is what you have been looking forward to doing. You researched, and purchased your choice of stations with the end game being that you have plans for what it will deliver for you. To maximize the instruments you now have access to will require setting them up properly. As you research this whole process you realize that buying the correct equipment is only a small part of the whole picture. It is necessary to correctly mount your station in a location that will maximize the readings from these weather instruments. With this in mind, you will now need to zero in on what manufacturer and make/model you have purchased. This will matter because of the remote sensor package that you now have. A larger more sophisticated remote sensor unit could be as large as a couple of feet of instruments, however most remote units are around 15-18 inches in length. This will make a sizable pack that needs to be secured in a good location. How do you figure out where to nest set this up, check out our What’s Involved in Weather Station Mounting post. We have many great points to think and act on. That will help you out with this. So if you own an AcuRite weather station then you will be dealing with an AcuRite weather station mounting. You will need to find out from there manual what their specifications are and how they suggest you would set up the sensor pack. So as you can see companies will give you specific directions on a few measurements that you must match up when installing the sensor on an AcuRite pole mounting. AcuRite does not seem to sell specific mounting poles, to be used with Acurite weather stations. 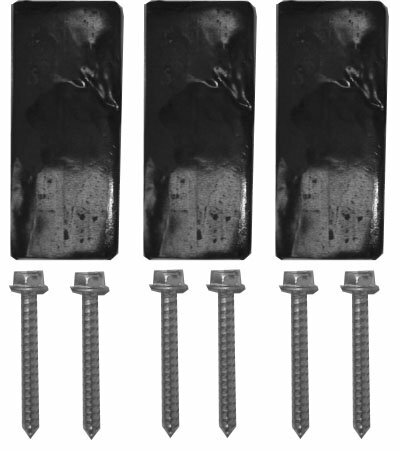 However there are mounting pole kits that you may choose from for your mounting project. I mentioned them in the earlier segment called Using a Top Weather Station Mounting Idea. Please go there to read on some of your options for mounting. There are Davis Instrument mounting kits or Ambient mounting kits that are popular and you could buy to use with the AcuRite. As you will notice, they can be used by any manufacturer’s product if the diameter of the coupling area match up with the PVC piping or piping that is being used to hold the sensors in place. The sensor’s come with a mounting coupler which will need to be attached to your roof or your pole or the top of your fence , etc, etc. Here is what it looks like for the AcuRite Pro 5 in 1 sensor. So probably the biggest thing is just making sure the elements are not going to affect the location of your weather station. Fasten it down, using a sturdy, (strong enough) mounting pole making sure all of your connections are tightened down well. Some of these parts are made of plastic so please note do not over tighten anything, or you may break or strip something. So remember you will get maximum usage and performance if you set up your weather station is a great location and make sure that it is secured properly, allowing it to be far enough above ground to get proper wind and temperature readings. Again these are discussed in our What’s Involved in Weather Station Mounting post. We hope this information has guided you, we are very glad to help you out with your set up. You will be able to get the best readings, if you find the best mounting location for your sensors. Using a Weather Station Mounting Pole to mount your personal weather station is usually needed. .
"To set up your 5-in-1 sensor, you need the sensor, the mounting base, two short screws and four long screws. First, remove the battery cover located on the bottom of the sensor, then set the A/B switch to A. Insert four "AA" batteries into the sensor and close the cover. Next, fasten the mounting base to a post or pole with four screws. Insert the mounting base into the hole of the bottom of the sensor. Make sure the arrows on top of the senor are pointed in the proper direction, and the bubble level is centered. Fasten the sensor to the mounting base with two screws. Then remove and discard the rain gauge stabilizer on the bottom of the unit. Your 5-in1 sensor is now ready to use."